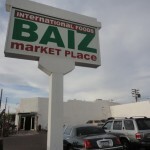 Though lonesome at first pass, thanks to wide-reaching (and deserved) word-of-mouth, Baiz Market (20th St., between Van Buren and Roosevelt Streets) has become a thriving Downtown treasure. Appreciated for its varied selection of edibles, from olive oils and spices, to hormone-free meats, produce and daily baked goods, it is a popular refuge for unadulterated, authentic Middle Eastern food. 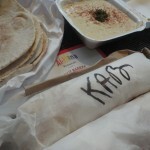 At the heart of Baiz Market rests Al Hana, the grocer’s in-house pit stop for goods made-to-order. 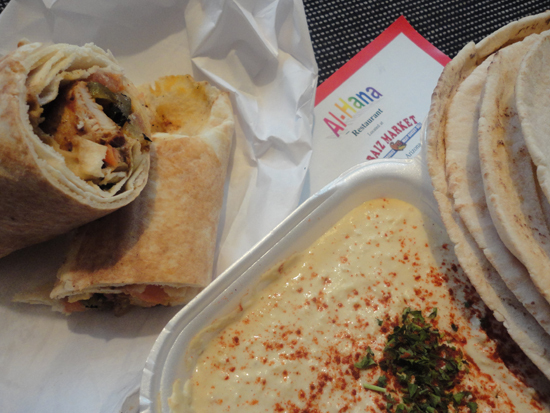 With the feel of a small, worn delicatessen, serving everything from large platters and “sandwiches” (think pita wrap) to baked goods both sweet and savory, Al Hana is bookmarked by many as a satisfying, inexpensive option for quick eating that doesn’t lack in quality or flavor. 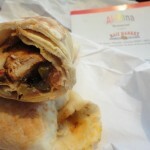 In addition to the many hallmarks served at Al Hana, including their homemade pita bread―distinctly thin, perfectly chewy and baked daily on-site―one of the most notorious stars is, roundly, the shish taook sandwich. Perfectly charred on the grill for the welcomed add-on of smoke and texture, marinated, fragrantly spiced hunks of tender chicken breast are then rolled firmly in said pita bread, lightly toasted, with the added strokes of sweet, juicy tomatoes, sharp onions, vinegary pickles, and the appropriate glue of a garlic sauce, mellow and creamy. Simple, savory and mouthwatering, the shish taook at Baiz Market’s Al Hana Restaurant is yet another Downtown bite worth regular returns for more. 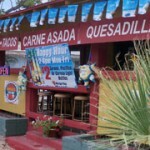 Baiz Market and Al Hana are located at 523 N. 20th St.